In the world of turf grass and grass plant structure, not everything is as it appears. If we see a lawn that has been around for several years, we think of the grass’ age starting from the time it was planted. In reality, this is only partially true. The grass itself is not as old as you might think, but may actually be only days old. A blade of grass lives an average of about 40 days. Your turf grass must continuously produce new blades (called tillers) to keep up with the ones that are dying back. When grass is started from seed, it starts off as a single blade. As it grows, dozens of tillers grow from the “crown” at the base of the plant. As tiller production exceeds the die back rate, the thickness of the lawn increases. A healthy lawn depends on its ability to continuously produce more tillers. The same thing is gong on with the roots. Roots die back just like the blades do. Over the course of a year, turf grass will shed it entire root system twice, replacing them with new ones. It doesn’t do it all at once, but a root at a time. The shed roots and blades help build up the organic matter in the soil. The most important part of the plant’s structure is the “crown”. It is the center of the plant’s life and the point where grass growth originates. The grass crown is the thick, whitish part of the turf grass that grows at soil level where grass shoots and roots meet. We can damage the roots or the grass shoots and both will grow back, but if we kill the crown, the plant will die. Simply put, if the crown is healthy, the grass is alive. Why is this important? Understanding plant structure and how grasses grow can help you evaluate the seriousness of grass problems. Lets use disease as an example. Diseases can sometimes affect turf grass and the grass blades can be severely damaged, but as long as the disease has not harmed the crown, it will usually live. If your plant gets a disease, it may need to be treated before the crown is affected. (More about this in “Grass Diseases”.) Look again at the picture on plant structure. The grass crown location is why turf grass can be mowed. From a plant structure point of view, as long as the crown is not removed by mowing, it will be okay. However, it can’t handle too much low mowing. There should always be enough grass blade for photosynthesis. In the same way, grass can grow new roots if they are damaged by digging or in some other way. These are some of the secrets about plant structure that lead to a beautiful lawn. Not damaging the grass crown is important to remember. The other is how grass grows. Since the life span of a blade of grass is short, turf grass must be continuously growing new tillers. Young grass is foundation of a healthy lawn. Old grass that is no longer producing tillers will thin, weaken and die. Other factors that can affect grass growth is a lack of nutrients, too much shade, soil compaction, heavy traffic, etc. Some of the important steps to keeping grass young and healthy is by fertilizing, mowing properly, providing irrigation as needed, aeration, dethatching, etc. A healthy, thick turf is a young turf. For more infomation that can greatly increase your knowledge of how plants grow, see the Photosynthesis page. Some turf grass types have the ability to spread and fill in bare or damaged areas. They do this by way of “runners”. These runners are actually grass stems that grow horizontally instead of vertically. The stems will either grow on top of the ground or below ground just beneath the surface. 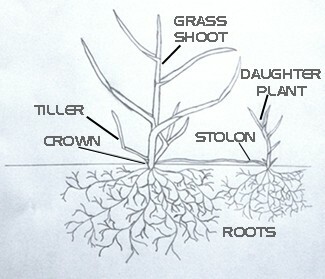 The stems that grow above ground are called "stolons" and the below ground stems are called "rhizomes". Each stem forms buds along its length that are called nodes. Each node will produce a new plant, identical to the mother plant where the stolen or rhizome originated. Each daughter plant will have a crown, roots system and grass shoots. If you were to cut the stolen between the daughter and the mother, the daughter plant will continue to grow and become the mother to other daughter plants. Professionals in the industry know this. For example, when planting bermudagrass, they will often go through and cut the stolons. That will break the tie to the mother plant and force the daughter to send out stems in different directions. This method will thicken and fill in grass faster than if the stolons were not cut. 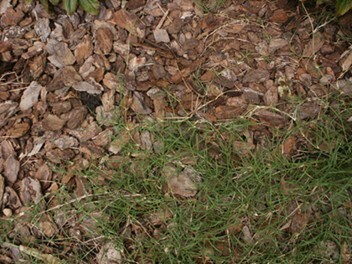 The Photo on the left shows bermudagrass stolons growing into a planter. This is a drawback with spreading grasses. Measures must be taken to keep grass from spreading into areas it is not wanted. Pulling bermudagrass doesn't help. It will grow from severed roots. Round-up is a better choice. Rhizomes are different from stolons because they grow below ground and also lack the chlorophyll that stolons have. Rhizomes look like white roots, however, they have nodes and form daughter plants just as stolons do. Roots are different from rhizomes in that roots are not stems and do not have nodes. Some grasses will produce only stolons while other grass species will produce only rhizomes. Some grasses like bermudagrass and zoysiagrass will produce both. St. Augustine will produce only stolons and Kentucky blue grass spreads by rhizomes only. Golf courses use these types of grasses because they quickly fill in damaged areas on tees and fairways. Fescue is an example of a turf grass that does not spread by stolons or rhizomes. It is a “bunch grass”, meaning that as it grows, the plant’s diameter gets larger, but will not spread. If you have large landscape planters in your lawn, fescue may be a good choice. It will not spread into the garden area. To keep fescue looking its best, it needs to be overseeded occasionally in the fall of the year. The addition of new plants that will grow from the seed will keep the turf vibrant and healthy. Fescue is only a good choice if you are in the right climate zone for it. To see which grasses are best for your area, see Climate Zones. Photosynthesis made easy! Understanding basic plant function will greatly improve your lawn care, especially when it comes to fertilization. You will never look at your grass the same way. In today's world, the effects of pesticides and fertilizers on home lawns are a concern. Fortunately, the majority of problems are not caused by homeowners. Click here to see detailed information and help on this topic.